Pigs differ from other ungulates in many aspects: they give birth to many offspring at once, they are omnivorous, they build a nest, sleep for 12-14 hours straight and they prefer to rest close to other members of the pack. Pigs were originally domesticated from wild boars 9000 years ago in Turkey. Like chickens, pigs have changed in phenotype, but they still share instincts with their wild ancestors. Pigs are omnivorous: they eat vegetables, mushrooms, nuts, fruit, insects, worms, small animals and even carcasses. Pigs rely strongly on their sense of smell and hearing. Sows recognize their piglets by smell, and boars smell the sows to check their heat. Voice and hearing are very important in the social behaviour of pigs. Pigs "chat" nearly constantly in quiet grunts to stay in contact with their pack. Warning signals and cries for help are high-pitched and loud. Boars sing a "love song" to attract sows, and the sow's voice signals tell the piglets when milk is available. (c) Daily Mail. Check their article about pig slaughtering. Pigs can't see very well. Thus their gestures are not subtle and small, but require a lot of space. For example, a dog recognizes a slight turn of the head as a calming signal. If a pig needs to calm a stronger animal, it turns away completely and then runs away for a short distance. In piggeries this is often impossible, so fights and injuries are common. Naturally pigs live in peaceful groups with stable social structure. In piggeries groups are often mixed, so the structure changes a lot and the animals have to create the "pecking order" over and over again. 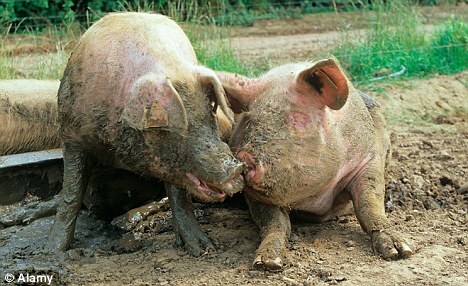 Unlike many other animals, pigs are contact animals. A sow does not lick its piglets, nor do pigs lick one another. Instead, they eat in groups and sleep side by side, close together. Even mating behaviour is rather straightforward: instead of courting, the boar can just mount the sow. Sows have a standing reflex, which means that in heat it will stand still when pressure is applied to it's loins. In addition to sleeping, eating is also synchronized. Pigs wake up at sunrise, and spend most of their time nosing the ground for food. They eat for 8 hours, and sleep 12-14 hours a day. Cleanliness: Contrary to popular belief, pigs are very tidy animals. They always separate a sleeping area from eating area and "bathroom" area. In piggeries this is not possible, and pigs are forced to sleep in their feces and eat in a dirty environment. Skin care: Pigs have two ways for skin care: wallowing in mud and scratching themselves against walls. Wallowing in mud is not just fun, it also cools the animal on a hot day, rubs away dead skin and removes parasites. Thermoregulation: Piglets under 3 weeks of age cannot thermoregulate, and in piggeries they depend on heat lamps. In the wild piglets live in a nest built by the sow, so they stay warm. Adult pigs have almost no fur and no sweat glands, so they can thermoregulate only by changing their behaviour. One or two days before giving birth, sows start to look for a place for a nest. They may wander several kilometers searching for a good spot. 6-12 hours before parturition the sow begins the actual nest building. It digs a shallow hole, and then collects branches, hay, turf and other materials, which it uses to build a nest. 1-2 hours before parturition the sow lays down on her nest. When the piglets are born, the sow lays passively. 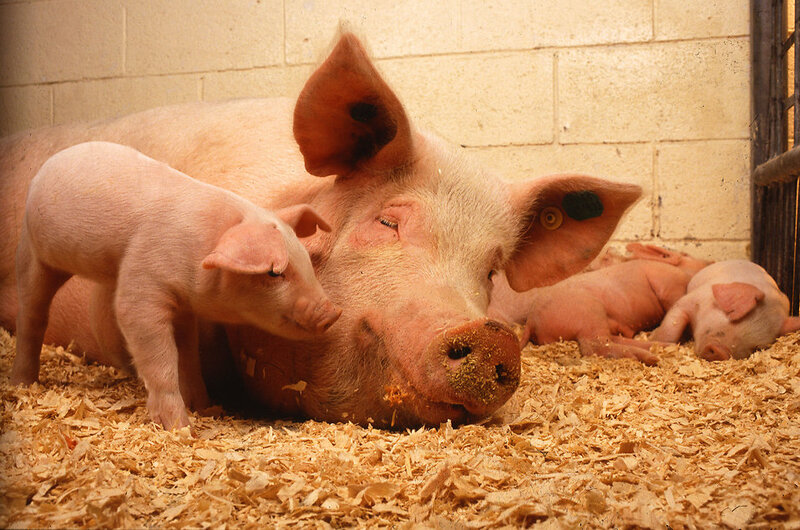 Domesticated pigs give birth to 10-15 piglets, which are born about 15 minutes from one another. After birth piglets instinctively crawl to the udder and start suckling. If a piglet doesn't get colostrum within few hours of birth, it will die. Colostrum is vital, for the piglets have no antibodies. If the sow is vaccinated before parturition, the piglets will get immunity as well. For the first three days the piglets fight for teats, but they then develop a clear "teat order": each piglet has its own teat. This is important, because after 12 hours the sow gives milk only once every 45 minutes. It announces milk letting by grunting, and every piglet has about 10 minutes to find a teat and suckle. The sow stays in her nest for the first 1-2 days, after which she leaves the nest for a short time as she goes eating. On 4th - 5th day the piglets leave their nest to follow the sow, and learn to find solid food. After 10-14 days the sow and her litter leave the nest and return to the herd. If the piglets do not follow the sow at this time, she may abandon the whole litter. The sow starts weaning her litter from the first week by slowly introducing the piglets to solid food and by regulating her milk letting. Final weaning will happen when the piglets are 10-25 weeks old, depending on the availability of food. In piggeries sows are not allowed to build nests, and they are often confined to tiny parturition crates for weeks. The crates don't allow the sow to turn around, sometimes not even to stand up. Crates are used so the sow wouldn't lie down on the piglets. Naturally the sow has an anti-crushing behaviour, but in piggeries the sow often cannot hear if a piglet screams when sat on. Studies show that parturition is faster, more piglets are born alive and the sow lets more milk when giving birth freely, compared to birthing crate. Building a having a sest also calms the sow, calms the parturition and improves the relationship beween the sow and the piglets. Pigs would eat for 8 hours every day. In a piggery this isn't possible, so the animals need plenty of modifiable litter and other objects which they can nose, chew, eat or otherwise modify. Straw, tree branches or hemp / sisal ropes are very good for this purpose. Problems with any of the factors of pig welfare may lead to the most serious behavioral prolem in any piggery: tail biting. Tail biting has been discussed in the entry about pig diseases. In piggeries, pigs are moved from one department or piggery to one another several times. Each department should take into consideration the needs pigs have at that particular age. Parturition dept: Since piglets are very sensitive, clean, dry and warm environment is vital for them. During the first few days piglets are castrated, ear-marked, given a tattoo and an iron injection, and their canines are filed. All these cause pain and risk for infections. Parturition dept must have clean space available for these operations. Flooring material is important, so the feces and urine can be cleaned, but the floor isn't too hard or cold for the piglets. Weaning dept: High-quality and clean water and feed are important to young pigs, who still have no stomach acids to kill any bacteria they ingest. Stable groups and temperature are needed, and stimuli help the pigs to relieve stress and pass the time. Meat pig farm: For adult pigs, stable groups and enough space are important. They must be able to sleep together and eat together, have separate areas for eating, sleeping and defecating/urinating, and they need space for social behaviour. Stimuli are also important. Temperature can vary more than in previous departments. Department for pregnant sows: Like the meat pig farm, but pregnant sows need even more space than meat pigs.